I don’t usually do much to decorate for St. Patrick’s Day, and this year with Easter coming along 2 weeks later, I really didn’t want to put much effort (or money) into it. So how about this? 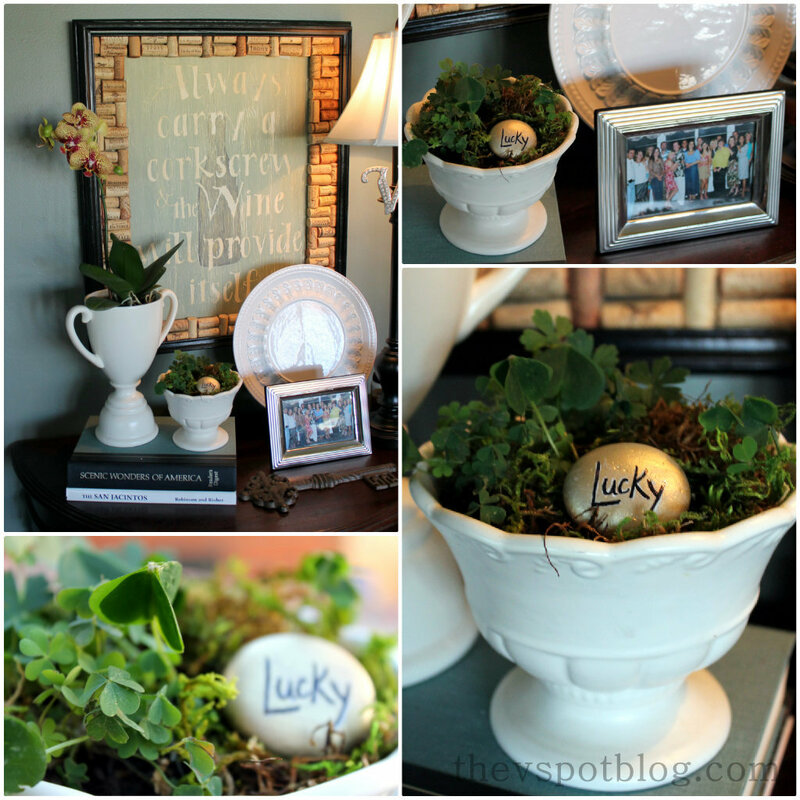 A quick and easy St. Patty’s project using weeds and rocks from your yard. Can’t get much cheaper than that, right? ha! Step 1: go out in your yard and find a little patch of clover. Step 2: dig it up and pop it into a little container or planter of some kind. Step 4: tuck it around the clover. Give it a nice drink and while the clover perks up, find a nice smooth stone. Step 1: paint it gold and let it dry. Step 2: grab a paint pen or a Sharpie and write Lucky on it. I initially used a white paint pen, but it wasn’t visible enough for me, so I went over it with a Sharpie. That’s the extent of my St. Patty’s Day decor this year. Easy, cheap and cute! How do you decorate for the wearin’ of the green? Brilliant! Seriously, I’m loving this! The only decorating I do is throw on my one green shirt and head to the bar! Love this! Clover and moss I got! !